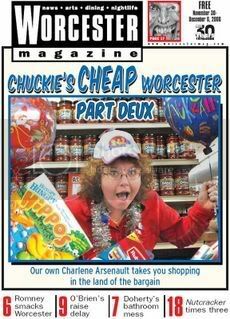 Don't everyone run out to get a copy all at once, but the Nov. 30 - Dec. 6 issue of Worcester Magazine includes a couple of paragraphs of mine in their Slants and Rants section. They reprinted a description of the DCU Center from a post about the Wolf Pack - Worcester Sharks game last weekend-- a description that was less than flattering towards Worcester, I think, but I don't care if they don't. I sorta wish they had found a better picture of me than the one they used for the front cover, though.